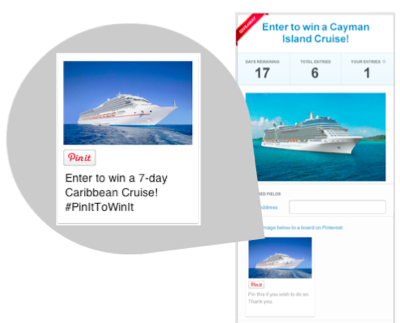 Rapidly increase your Followers and jumpstart engagement by integrating Pinterest within your sweepstakes and contests. Increase your promotion’s awareness by rewarding users for pinning images with descriptions and links to your contest. Grow your Pinterest Follower base by requiring users to follow your Pinterest account or ask your entrants to follow a specific Board that you’ve created. In addition to the Pinterest specific features, you can also include actions for your Twitter, Facebook and Instagram followers as well as creating custom entry actions and auto-subscribing entrants to newsletter lists in our email service provider account. All of your data is accessible with real-time reporting and can be exported to spreadsheets. Choose from a variety of themes or create your own entry forms with fonts, images and your own brand identity. Add your entry forms to your websites, blogs and Facebook pages. Run a single campaign on multiple websites simultaneously. Access and view data with real-time reports to analyze your promotion's success. Export your data to CSV files for external use.